BODIE — At its peak, this Eastern Sierra mining town boasted 10,000 residents and 27 saloons, and blood flowed as freely as whiskey. The town churches chimed the ages of the men killed in sidewalk gunfights and poker-room shoo-touts. Accounts from Bodie’s Daily Free Press said the bells rarely stopped ringing. Bodie was a good town for under­takers. Miners hauled millions of dollars in gold from her pits. Her stock shares soared from 50 cents per share to $45 per share in one year. Twenty years after W.S. 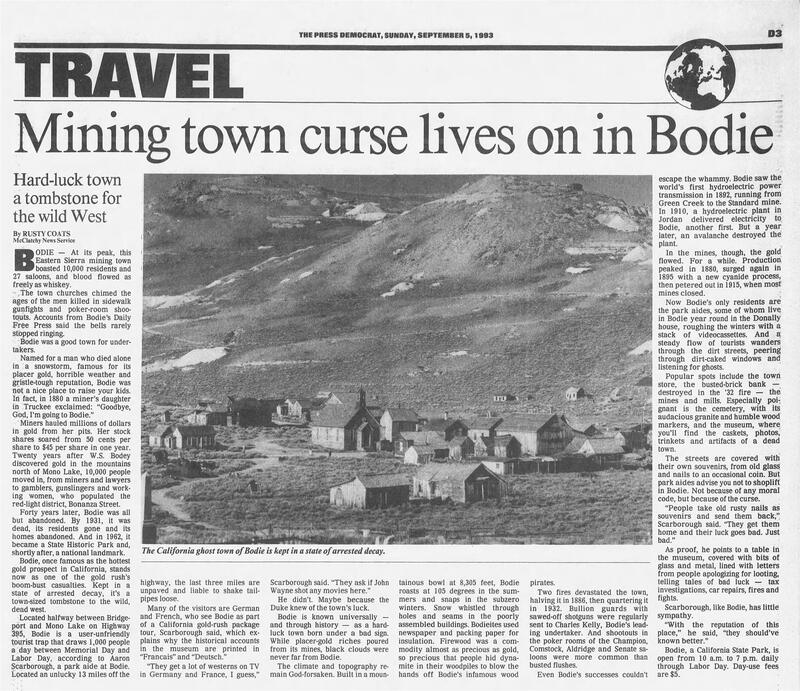 Bodey discovered gold in the mountains north of Mono Lake, 10,000 people moved in, from miners and lawyers to gamblers, gunslingers and working women, who populated the red-light district, Bonanza Street. Forty years later, Bodie was all but abandoned. By 1931, it was dead, its residents gone and its homes abandoned. And in 1962, it became a State Historic Park and, shortly after, a national landmark. Bodie, once famous as the hottest gold prospect in California, stands now as one of the gold rush’s boom-bust casualties. Kept in a state of arrested decay, it’s a town-sized tombstone to the wild, dead west. Located halfway between Bridge­port and Mono Lake on Highway 395, Bodie is a user-unfriendly tourist trap that draws 1,000 people a day between Memorial Day and Labor Day, according to Aaron Scarborough, a park aide at Bodie. Located an unlucky 13 miles off the highway, the last three miles are unpaved and liable to shake tail­pipes loose. He didn’t. Maybe because the Duke knew of the town’s luck. Bodie is known universally —and through history — as a hard-luck town born under a bad sign. While placer-gold riches poured from its mines, black clouds were never far from Bodie. The climate and topography re­main God-forsaken. Built in a moun­tainous bowl at 8,305 feet, Bodie roasts at 105 degrees in the sum­mers and snaps in the subzero winters. Snow whistled through holes and seams in the poorly assembled buildings. Bodieites used newspaper and packing paper for insulation. Firewood was a com­modity almost as precious as gold, so precious that people hid dyna­mite in their woodpiles to blow the hands off Bodie’s infamous wood pirates. Two fires devastated the town, halving it in 1886, then quartering it in 1932. Bullion guards with sawed-off shotguns were regularly sent to Charles Kelly, Bodie’s lead­ing undertaker. And shootouts in the poker rooms of the Champion, Comstock, Aldridge and Senate sa­loons were more common than busted flushes. Even Bodie’s successes couldn’t escape the whammy. Bodie saw the, world’s first hydroelectric power transmission in 1892, running from Green Creek to the Standard mine. In 1910, a hydroelectric plant in Jordan delivered electricity to Bodie, another first. But a year later, an avalanche destroyed the plant. In the mines, though, the gold flowed. For a while. Production peaked in 1880, surged again in 1895 with a new cyanide process, then petered out in 1915, when most mines closed. Now Bodie’s only residents are the park aides, some of whom live in Bodie year round in the Donally house, roughing the winters with a stack of videocassettes. And a steady flow of tourists wanders through the dirt streets, peering through dirt-caked windows and listening for ghosts. Popular spots include the town store, the busted-brick bank — destroyed in the ’32 fire — the mines and mills. Especially poignant is the cemetery, with its audacious granite and humble wood markers, and the museum, where you’ll find the caskets, photos, trinkets and artifacts of a dead town. The streets are covered with their own souvenirs, from old glass and nails to an occasional coin. But park aides advise you not to shoplift in Bodie. Not because of any moral code, but because of the curse. As proof, he points to a table in the museum, covered with bits of glass and metal, lined with letters from people apologizing for looting, telling tales of bad luck — tax investigations, car repairs, fires and fights. Scarborough, like Bodie, has little sympathy. Bodie, a California State Park, is open from 10 a.m. to 7 p.m. daily through Labor Day. Day-use fees are $5.